Kelsey Wallace, Public Relations & Marketing Manager for the Alaska Native Heritage Center visited with Morning Line in Late November to talk about the Holiday Bazaar coming up December 2nd and 3rd, 10am to 5pm. Wallace says the event usually features not only customary and traditional art forms, but also contemporary arts and crafts and works in other mediums like photography. Wallace says in addition to more than 60 Alaska Native Vendors coming from different cultures all over the state, a toy drive is under way – you can sponsor a child grades Kindergarten through 6th grades, and the drive is hoping to get new toys, warm coats, hats, gloves and school supplies to be donated to kids in need. These items will be collected under the tree at the Holiday Bazaar. Wallace also adds that if you bring your appetite, you won’t be disappointed – an addition to this year’s Holiday Bazaar is food trucks, specifically Mobile Munchies907 – frybread tacos, akutaq and salmon chowder are on the menu. 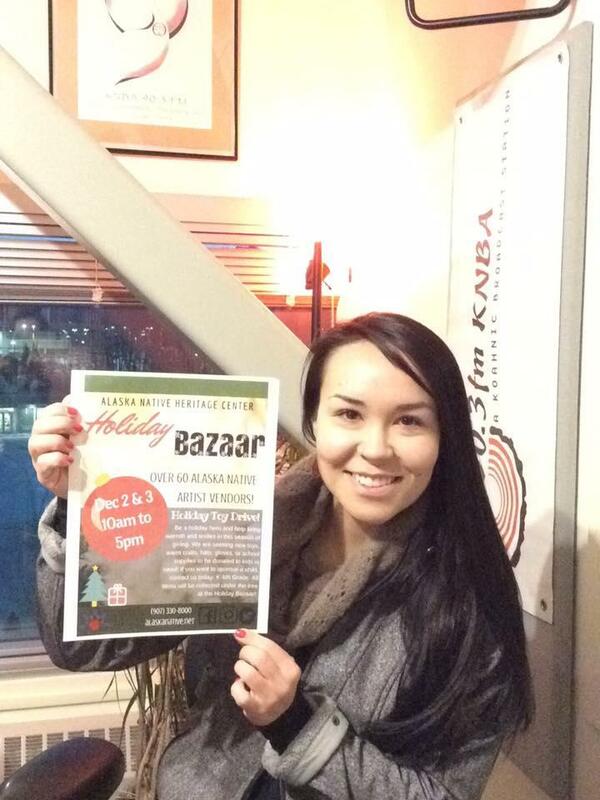 Kelsey Wallace visits on Morning Line about the upcoming Holiday Bazaar at the Alaska Native Heritage Center. Click to hear Loren, Frank and Kelsey's favorite holiday bazaar finds. This weekend the Alaska Native Heritage Center is hosting it's Fall Festival, an annual event, and this year it coincides with Halloween. The event offers up trick-or-treating, ghost stories, and live entertainment from Todd Grebe and Cold Country, tomorrow starting at Noon. Kelsey Wallace, Public Relations and Marketing Manager, says one storyteller, John Active, is flying all the way from Bethel to tell stories. "When John Active comes, it's a real crowd-pleaser. He'll be on the stage at certain times throughout the day." KNBA at the Alaska Native Heritage Center! KNBA helps celebrate the Groundbreaking & Dedication Ceremony for the new Mabel Pike Education Center at the Alaska Native Heritage Center! The event took place Friday May 9th, 2014 and included a dance performance by students of the Alaska Native Cultural Charter School. Anchorage, AK – Elders teach students how to process seal carcasses at the Alaska Native Heritage Center. Alaska Native Heritage Center hosts Free World Music Festival! The Alaska Native Heritage Center hosts their Annual World Music Celebration Saturday, October 11, 2014; 10:00 a.m. - 5:00 p.m.